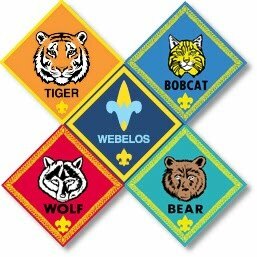 To earn the rank of Tiger, you scout will need to have a Tiger Handbook (available at the Scout Shop or online at www.scoutstuff.org) to begin working on the Tiger Trail. Below is an outline of the material covered in the handbook. PLEASE NOTE! For the 2015-2016 program year, Cub Scouts has a brand-new program and curriculum. In order to have the latest material, your scout will need to have the new Tiger Handbook! To begin his path to the Tiger Rank, a boy must first earn his Bobcat Badge. The Bobcat Trail is outlined at the beginning of every handbook in Cub Scouts. Once completed and reported to your Den Leader, the Bobcat Badge will be awarded at the next Monthly Pack Meeting. Note: Once a Bobcat, always a Bobcat! Once he earns his Bobcat Badge he can skip it in other handbooks as he advances through the ranks. Go for a short hike with your den or family, and carry your own gear Show you know how to get ready for this hike. Share with your den how you got your name. With your den or family, visit a planetarium, observatory, science museum, astronomy club, or college or high school astronomy teacher. Before you go, write down questions you might want to ask. Share what you learned with your family. a. Play a video game with family members in a family tournament. b. List at least three tips that would help someone who was learning how to play your favorite video game. c. Play an appropriate video game with a friend for 30 minutes. Explain your map, and try a practice fire drill at home.